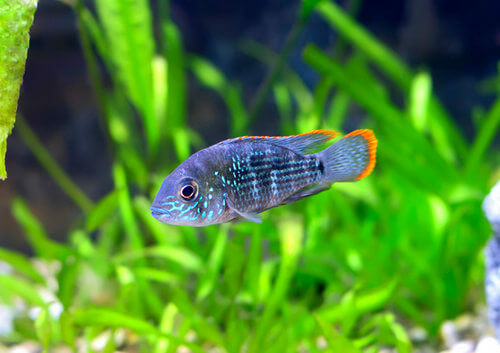 African Cichlids For Beginners | Care Guide And Tips. Are you considering an African Cichlids Aquarium? There are many factors to having one, and so many varieties to choose from. 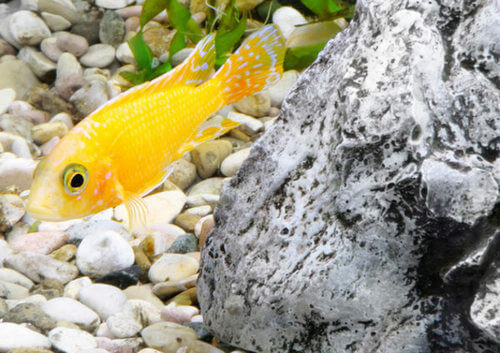 The African Cichlids fish is the most popular of all aquarium fish and the Electric Yellow is the most commonly found in pet stores. They are extroverts to say the least, and display some very curious behaviours and personalities. Under the right conditions Cichlids can live up to 10 years, and grow 3-4 inches (8 - 10 cm). Cichlids are an aggressive, territorial breed, the most so during spawning and breeding. They are a predatory fish by nature, and can be very destructive. There are only two things that can stop their insatiable drive to dominate. Take their territory away from them by packing the tank with numerous Cichlids, almost to the point of overcrowding. They are mainly bottom of the tank fish, so another way is to fill your tank with an overabundance of large structures such as rocks, caves, and large plants. Taking away their territory takes away their bad behavior. This same odd behavior can make Cichlids fun to watch. They are fast, alert, active, and always up to something. Where most fish school together, cichlids continually travelling all over the aquarium, darting around, exploring everywhere. African Cichlids are also a very social fish. They love to interactive with people. They seem to recognise their owners, looking at them with recognition. Whereas if a stranger comes into the house, they hide in their safe zones of rocks and plants. The water should have a hardness, and slightly alkaline, with a pH range of 7 - 8.5. The recommended temperature is 71.6 - 82.4°F. African Cichlids are more tricky than other aquarium fish, which in itself gives the potential interest of the hobbyist. If you can keep these aggressive fish in peaceful surrounding they are quite enjoyable and worth the challenge. One way to do this is to imitate their natural habitat, filling it with aquarium ornaments such as rocky outcroppings, a sandy bottom for them to dig into, and some deep grass. Every african cichlid aquarium should have an abundance of Vallisneria, which is common for other species as well. Cichlid need both greens such as algae, vegetable flakes, pellets, spinach, peas, lettuce. They also need meaty foods such as brine shrimp, bloodworms, and larvae.Feed them enough to be eaten in five minutes, about twice a day. 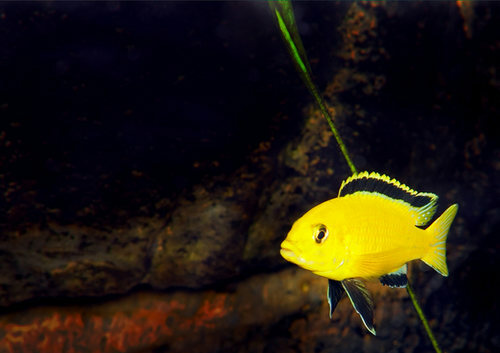 The Cichlid is not only territorial over food and females, but especially so toward similar colored and shaped fish in the Cichlids aquarium. The females will be safe if there is only one male. The ideal number seems to be 3-4 females and 1 male. The best compatible fish are larger ones which can’t be eaten, and are not seen as competition. Bottom dwellers are less aggressive, stay out of the way, and help with the algae. Swim Bladder diseases from parasite, bacteria causes it, and it happens mostly in older fish, but young die from it as well. Malawi bloat is most common among African cichlid fish. Symptoms can be swelling in the abdomen, loss of appetite, rapid breathing, discolored feces and lolling on the tank bottom. It can lead to liver and kidney damage if left untreated. It is caused by a protozoan that lives in the intestines and can be fatal within two days. Tuberculosis is a highly contagious and frequently fatal. This disease can be transmitted to humans through contact with open wounds or sores. The symptoms include loss of appetite, white blotches on the skin and a sunken stomach, and frayed fins. The fish may also display changes in its behavior becoming more lethargic. Cotton wool disease is a fuzzy white growth on the head, scales, and fins of the fish. It is caused by a fungus that is naturally found in the aquarium but has become out of control due to poor water conditions. Stress or injury also increase the susceptibility of fish to fungal infections. Hole in the Head Disease is also called hexamita, and is fairly common among freshwater fish but is most commonly associated with cichlids. Symptoms are a depression in the head, lesions on the lateral line, loss of appetite, and weight loss. It can be caused by very poor water qualities, and a parasite called Hexamita. White spot disease called Ich is the most frequent and causes spots all over the fish, they lose appetite, and spreads quickly throughout the tank. Gill Flukes is caused by a parasitic flatworm in the gills of fish. It attacks the membranes and they become red.They will grow a thick coat of slime making it difficult for the fish to breathe. Some may be solved with a home remedy, others will take an antibiotic or disinfectant. To begin, a clean tank is the first step to a healthy tank. Methylene Blue will disinfectant or cure fungus, flukes, and protozoic attacks. Malachite Green fights bacterial diseases like White Spot disesase. Formalin kills external parasites if used according to the directions. Is my cichlid a male or a female? Because the submissive males are less aggressive, they sometimes look less vivid and bright in their color…like a female. First, find your dominant male, and compare the others. The dominant will be much brighter, and the fins will be solid black and longer than the females. Females have yellow fins, and they are smaller. There are subdominant males too which makes it a little more tricky. You best best is to get a book of Cichlid pictures if you are going to have a tank full of them. Cichlids are very good parents and protect their fry until they grow large enough to protect themselves. They are mouthbreeders. The male chooses the spot usually by a flat stone, where the female lays her eggs and he will then fertilise them. After which the female collects them into her mouth, and goes into hiding for about three weeks keeping them safe inside. I highly suggest if you are going to start breeding an African Cichlids aquarium, you will need an excellent book to follow along with when you need it.